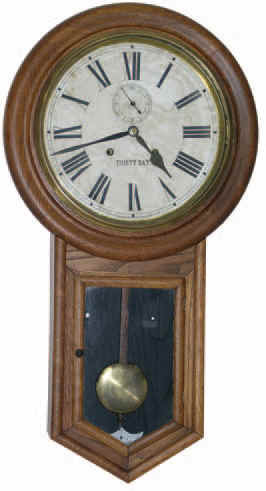 Waterbury Clock Co. hanging clock "Admiral", ca. 1906. The 32 inches high oak case has been refinished; the 12 inches paper dial is original with light water stains. Pendulum bob, stick and hands are original; the seconds hand replaced. The glasses are in good condition but may be old replacements. Backboard painted black; has Waterbury porcelain beat indicator. 30 day double wind time only movement in good running condition. Ly-Waterbury No. 708.